The Dropkick Murphys went up to Boston, the Blackhawks blew them out. The Hawks came out flat as Antti Niemi allowed two goals in a little over eight minutes, allowing the Bruins to seemingly take control of the game in their house early. But apparently they were just giving them two goals to help their self esteem. After the second Boston goal, the Hawks started a parade into the back of the net that ended with Tim Thomas playing the part of The Departed. The Olympian Thomas allowed goals to Duncan Keith and suddenly-hot Tomas Kopecky before the first intermission as the Hawks were able to storm their way back to a tie. Andrew Ladd broke the deadlock only 1:42 into the second period, and when Keith scored his second goal of the game just over ten minutes into the game, it was shower time for Thomas. At the end of two, the Hawks were doubling-up on the Bruins on the scoreboard, 4-2, and were up 29-13 in shots. The route was on, and the Hawks streak of scoring at least four goals was successfully extended to five games. 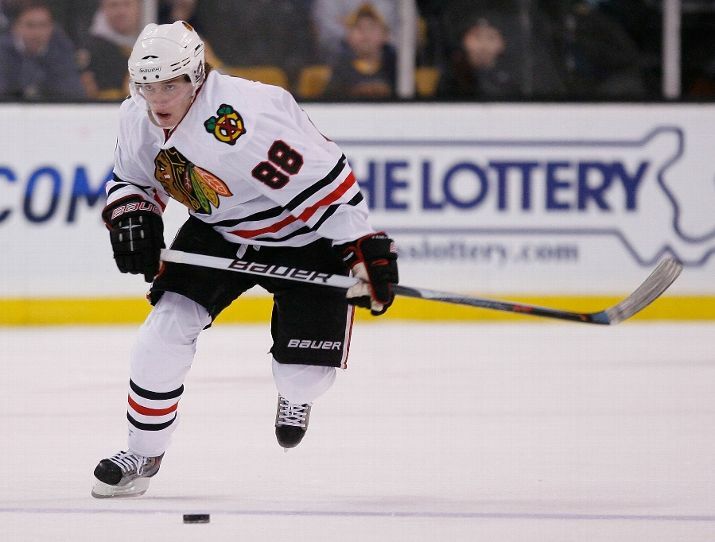 In the third, the question was whether or not Patrick Kane could keep his roll going. What made matters tough for Kane and the Hawks after Thomas left the game was that his replacement was the top goaltender in the NHL. Tuukka Rusk, who entered with a 10-4-2 record and a 1.92 goals against average, was as sharp as Thomas was loose, keeping 11 of the 12 shots he faced out of the net. The one he let through: Kane’s 19th goal of the season. Keith and his partner on the blue line, Brent Seabrook, were both plus-four for the night. Keith added two hits and an assist while Seabrook was credited with three blocked shots on a stellar night from the Canadian Olympians. Keith and Ladd have both scored eight goals now this year, and Kopecky has now scored three goals in his last four games. The Blackhawks are getting contributions from everyone on their roster, and opponents are clearly struggling to matchup with Chicago’s offense. For Boston, who lost Patrice Bergeron to a hand injury earlier this week, the predicament got worse when Marc Savard collided with Jonathan Toews only 26 seconds into the game. Savard did not return to the game. The Blackhawks fourth line continued its strong play, taking advantage of the Bruins mixing their lines in Savard’s absence, as Colin Fraser and Ben Eager were both credited with two assists on the night. Fraser was involved in two fights in the game as well. Unlike the final score of the game, Fraser didn’t win either contest. He did win five of his six faceoffs, though, as the Blackhawks dominated in the circle again on Thursday night. John Madden won 11 of his 18 faceoffs. Niemi rebounded well after the shaky start, ending the game stopping 19 of 21 total shots. He is now 11-2-1 on the season, and is closing in on having played enough games to qualify for the league’s official statistical leaders. There was actually a pretty decent contingent of Blackhawks fans. K of C was also in town and at the game. She had on a Duncan Keith tee shirt. As a dual Blackhawks/Bruins fan living in the Boston area, I made it a point to root for Chicago (who is now by far my favorite team). It was my little way of thanking Jeremy Jacobs for practically doubling single-game ticket prices this season. Jeremy Jacobs, I hope you get run over by a gas truck and taste your own blood!!! PS-Lest anyone accuse me of frontrunning, I have been going to Chicago on a regular basis since 2006 (for work and for pleasure), and catching games whenever I can. I bought my first two ‘Hawks jerseys in the summer of ’06 (pre-Kane and Toews) when the team was so unpopular the shipping cost me more than one of the jerseys. I have cheered for Tuomo Ruutu, Rene Bourque, and Michal Handzus. I also have a huge Blackhawks neon sign on my living room mantle that I bought in 2008. LOL! Daniel – thanks for commenting. That’s awesome that you guys took the Indian to Boston last night! It always helps when you bust out a Keith jersey and he backs you up with two goals and an assist… Great all around game from the Hawks! 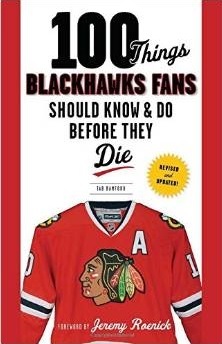 I’m sure with Boston down Bergeron and now potentially Savard it’ll be easier to show your Blackhawks passion. I didn’t have time for commenting while on my trip, but I wanted to chime in here. I like the Bruins so I was sad to see them play that badly, but seeing yet another Hawks win was great. I was squished in an upper-level seat between Bruins fans (who were friendly) but then Dan’s friend had to leave early and I got to sit much closer for the last 7 minutes of play. I’m sure the Boston fans there (well, they were clearing out by then) were thrilled to see TWO people in Keith shirts together, when he’d already scored two goals…Dan’s favorite player had an amazing game. As for the two Hawks games since, it’s just as well I wasn’t able to watch those games online like I would have if I’d been at home!